We are kicking off this year's Great Backyard Bird Count with a free walk at DeKorte Park in Lyndhurst, followed by coffee, hot chocolate and light snacks at the Meadowlands Environment Center. The walk begins at 10 a.m. outside the Visitor Center. We hope to see plenty of waterfowl and some raptors, and maybe a surprise or two. Please RSVP to Jim Wright here or call him at 201-460-2002. Click the Northern Cardinal for more informationon the count, and e-mail Jim if you get any great sightings in the Meaedowlands over the four-day weekend. We'll post all we saw, and other sightings, next Tuesday. 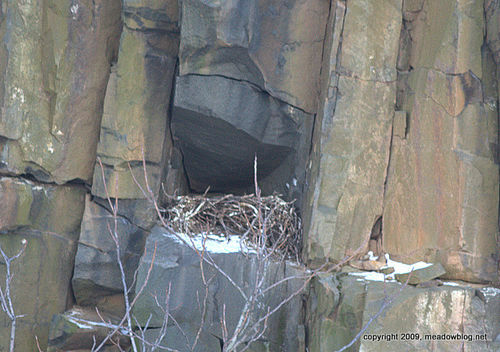 We came across this Raven's nest at Hudson County Park at Laurel Hill. As birder Ray Duffy has posted, two Ravens have been seen in that vicinity earlier this month: "At Laurel Hill Park, I finally got the pair of Common Ravens. I'm going to assume they are the breeding pair because they were both hanging close to each other and I'm certain it looked like they were preening the back of each other's heads as they picked at the snow for food." Don Torino also reports seeing a Common Raven — on Sunday on Valley Brook Avenue in Lyndhurst. An earlier post on Ravens is here. As for the bad Raven poetry, nevermore.